Virat Kohli and Jayant Yadav recorded their career best scores of 235 and 104 respectively as India took a massive lead of 231 runs in the first innings. Indian spinners then put on a show as they ripped England's top-order apart as the visitors face a heavy defeat at 182/6 at the end of day 4. 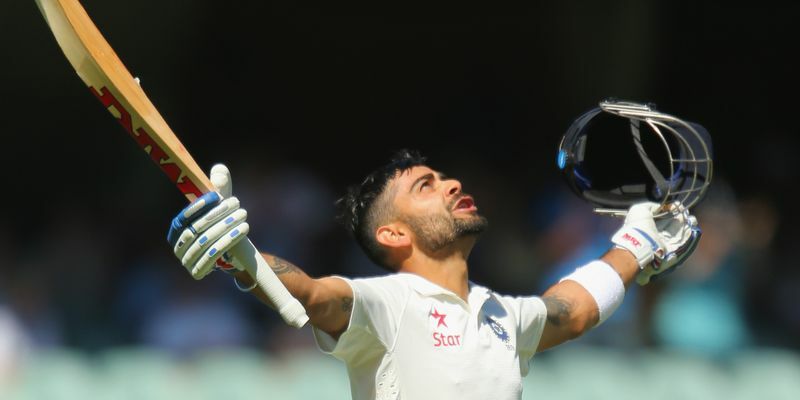 Resuming the day on 451/7, the unbeaten duo of Virat Kohli and Jayant Yadav ensured that India would engorge their 51-run lead from Day 3 to a big one. Although the ball was turning viciously, Kohli and Yadav scored at quick rate against the hapless English bowlers. While many expected the English spinners to put the brakes on Indian juggernaut by landing the ball in good areas, Virat Kohli went after them from the onset. Before taking on Adil Rashid, Kohli drove a Jake Ball delivery straight down the ground for a four to bring up his 150. The pressure of bowling 44 overs in the previous day seemed to take a toll on Rashid as he started leaking runs on a continuous basis. When Alastair Cook saw his ploys to attack with a combo of a pace and spin failing, he brought on Joe Root from the other end. Root started up with a full-toss but that was duly dispatched to the midwicket boundary by Virat Kohli. As the lead moved past 100, India started playing a more attacking brand of cricket. Scoring at a brisk pace of 5.3 RPO, Kohli reached his third double century of the year with a wristy flick towards the mid-wicket off Adil Rashid with the score at 557/7. At the other end, Jayant Yadav showed tremendous constraint and proved that the talk surrounding his batting ability was no fluke as the Haryana lad brought up his maiden century in Test cricket with a single off Chris Woakes. Rashid finally got a breakthrough with the score reading 604/7 when he invited Jayant for a cover drive only to miss to completely and Jonny Bairstow easily took the bails off. The dismissal of Jayant hastened India’s innings as Kohli fell for Woakes' delivery pitched wide of off stump, ending his epic innings of 235 runs with the lead stretching to 215 runs. India folded up for 631 runs, after a couple of boundaries from Bhuvneshwar Kumar. Trailing by 231 runs, England needed to adopt a more cautious approach. But Bhuvneshwar Kumar had debutant opener Keaton Jennings trapped in front for a golden duck in the first over itself. Keaton failed to understand the late swing of Bhuvneshwar Kumar and perished with the score reading 1/1. English captain Alastair Cook continued his struggle against left-arm spin as Ravindra Jadeja dismissed the English captain for his 100th Test wicket and leave England at 43/2. Joe Root tried to go over the top of Indian spinners but Jadeja did the damage at the other end by dismissing Moeen Ali for a duck. But the more credit has to be given to Murali Vijay, as he gobbled up a beautiful catch in the slips to send Ali packing. While Root tried to be resilient alongside Jonny Bairstow, he failed to play a Jayant Yadav delivery that remained full on the line to be dismissed for 77 and departed as England’s fourth wicket. He went for a review but the third umpire didn’t alter the decision. Ben Stokes was promoted up in the order, but couldn’t help his teammate Jonny Bairstow to build a good partnership as he became the first victim of Ravichandran Ashwin in the second innings with the score reading 180/5. Bairstow completed a valiant half-century at the end of the day before Ashwin dismissed rookie all-rounder Jake Ball for a catch to the keeper to end the day at 182/6.